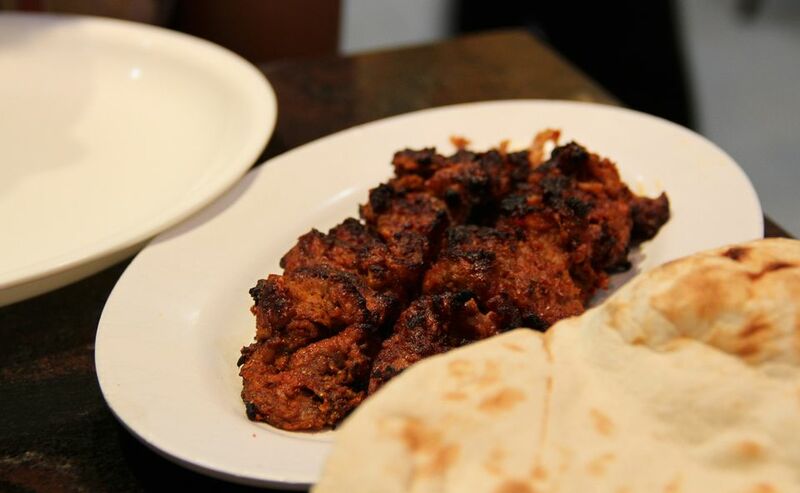 Enjoy this grilled North Indian kabab with piping hot Naans (tandoor-cooked Indian flatbread). Bihari kabab is sold as street food in Kolkata. While beef is restricted or prohibited in most of India due to the respect of the cow in Hinduism, it is unrestricted in a handful of states in northeastern India, such as in Bihar and West Bengal. The meat from water buffalo is not usually restricted. In regions with a Muslim majority, more beef and buffalo are consumed. As it is often the older animals that are slaughtered, the meat is tenderized by the long overnight marinating time and use of papaya paste is used for tenderizing the meat. You can substitute chicken for beef but the papaya paste should be eliminated and it should only be marinated with the spices for one hour. You will need skewers and a grill. If you are using wooden skewers, you may want to soak them in water beforehand so they withstand the heat of the cooking flame. Fry the onions in the oil until they are soft. Drain them on paper towels. Use a food processor or mortar and pestle to grind them into a smooth paste. Mix the onion paste and all the spices (garlic paste, ginger paste, ground cumin, ground coriander, ground black pepper, red chili powder, star anise powder, mace powder, but not the papaya paste) with the yogurt and add the beef strips to this mix. Add salt to taste and set aside for 8 to 10 hours in the refrigerator. Add the raw papaya paste to the yogurt and beef mix about 1 hour before you are ready to cook the kabab. The papaya paste will tenderize the meat and you do not want it to chili for more than an hour. Thread 8 to 10 beef strips onto each skewer and grill them until they are browned and cooked to your desired level. Serve immediately with piping hot naan (tandoor-cooked Indian flatbread). You can use raw, grated papaya if you don't have papaya paste available. The papain enzyme in papaya breaks down the meat to tenderize it. Note also that mustard oil is a traditional part of this dish. You can give the meat skewers a brief saute in mustard oil before placing them on the grill.